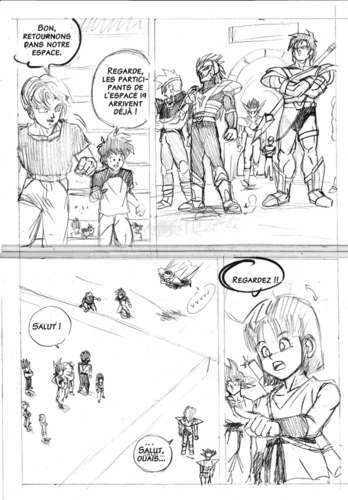 I'll use this space to tell you a bit about our collaboration with me, Salagir, and Gogéta Jr, for the creation of our fanmanga on Dragon Ball's univers. So here is revealed, to everyone, how goes the creation of a page, with each of its steps ! When I write the scenario, I make it with the dialogues, and an idea of the layout. I write this last strongly in advance compared to the drawings to be able modify it modify it again depending of the need. I send to Gogeta Jr many pages of the scenario at a time, and the ugliest drawing possible of the layout that I imagine (cf step 2). (guys team dbz)- Look, the performers from space 19 already arrived ! (team 19 "knights in armor" arrive in their space. (guys team dbz)- Look ! I scribble as ugly as possible the idea that I have of the corresponding layout. A picture is worth a thousand discourses and it helps me also to see if it would makes good. In this drawing, it can happen to a chiader box to show the angle of view that I have in mind. This won't prevent the drawer not to go his own head and to change according to his desire, often for the best, too! Then I get the sketch of Gogeta Jr. Very accurate, it already gives the final appearance of the page. I also include my proposals for alterations. There rarely. Here, I proposed to ascend the bubble that unnecessary hid Pan's hair. I also asked in my answering email to make bigger weapons for the knights. 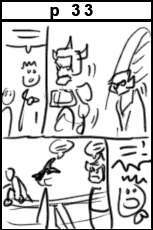 I also said that the plan for the third frame did not need to be from the top, and that I would like to see better Goku's head and the reaction of the knight. Finally, since I know that in the manga Dragon Ball, the gentiles' bubbles are round and those of evils have angles (a reader has pointed this out to me, and it's true), I corrected in our version. After, I add the texts in both languages (the French version was already up in step 4, I just had to refocus a bit in the bubbles). I add the small copyright, and other elements if necessary, like here the number of the univers written at the top of the entrance. I upload the final files on the website, in a magic file, where my automatic script will find it on Sunday or Wednesday at 8 p.m., to make it visible.